After years of riding behind someone, I decided to buy a motorcycle of my own. My fiance was very encouraging. After much research on the internet and discussions with my fiance,I bought a pretty little '87 Honda Rebel 450 last April. I wanted something a little more than a 250, but also something I could handle easily. This is a fun bike to ride. It has enough power to keep up with the bigger bikes. I went last year on a 400 mile benefit ride for the National Guard. I had a great time. When my fiance is at Guard drill, I no longer have to wait til he is home to ride. It's also a great stress reliever after a hard day at work. I have added a windshield and saddlebags to the bike. Several people (mostly men) tell me I should move up in size. I just ignore them. I love my bike and that's what matters. So ladies, don't let anyone pressure you into getting something you don't really want. You have to be comfortable with your bike in order to enjoy it. I just purchased one and it's my very first bike ever!!!!! It just so happened that I stumbled upon it without even really looking. I'm so excited because I'm only 5'2" and it's hard to find a bike that I can sit on and reach the ground but is also fun to ride. I can't wait to take it out. very nice if interested it is 2400 and I am joe 2709032120 in ky. I've been riding motorcycles for many years. 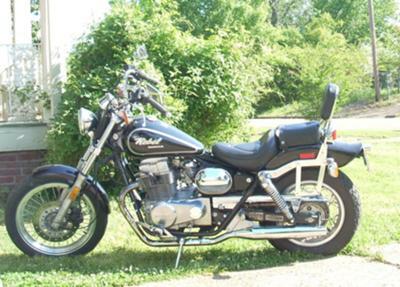 I bought a brand new 250 in 1980 it was a Kawasaki 250 and it didn't have any power. Then I got married and rode behind my husband for many years. Then as the children grew up I had my own bikes, a gutless 550 Honda and then a 750 Suzuki Madura... Now THAT was a fabulous bike and I AM a bit of a speed demon. But being short (5'3") I always felt a bit disadvantaged being on my tip toes. One day I found a bumble bee yellow 750 Honda Magna V-4, nice bike, and could sit flat footed and go 110 mph on it. But if I dropped it (and I did twice) I had to wait for someone to help me pick it up. Rather embarrassing. I also liked it when my husband wheeled it out for me in tricky spots. (so I didn't drop it) Finally I quit riding by myself because I didn't feel comfortable enough. Ah ha! Now I have a 450 Honda rebel and I LOVE it. I take off on my own when ever I feel like it and I can sustain 65 mph all day long (probably safer than my other top speeds) and I can do loops, tight corners, back up, push it, pick it up etc. It is MINE, truly mine. Certain people will tell you it's too small, it's a Honda, it's a girl bike, what ever. Bottom line: You have to be comfortable and safe all at the same time in order to have many years of biking. So experiment if you wish, but follow your heart. I got an '86 Rebel 450 back in 86, and still have it today. It was as much fun to ride then as it is now ...and I'm a guy. Great choice in bike - enjoy the ride! I love your bike! And I'm glad to hear you stand up to the guys who think you should go bigger!